Dr. Kaplan is considered a leading expert on the rapidly developing problem of “anthelmintic resistance” which means the dewormers available are losing their effectiveness in the field with no new products on the horizon to take their place. He explained that although new drug “classes” entered the market every decade from the 1950s to the 1980s, it has now been over 30 years since ivermectin was introduced in 1981. Basically ‘we have what we have’ which is 3 major chemical classes or families of dewormers known as the Benzimidazoles (SafeGuard®/Valbazen®/Synanthic®), the Macrocyclic Lactones (Ivomec®/ Cydectin®/ Eprinex® & LongRange®/Dectomax®) and the Imidazothiazoles/ Tetrahydropyrimidines (Rumatel®/ Strongid®/ Prohibit® or Levasol®). “Resistance” is the term used for the ability of a parasite to survive after treatment with a dewormer given at the right dose, at the right time and in the right species. What was once a sheep and goat problem is now a growing cattle concern. The first case in US cattle was reported in 2004 and serious problems are now recognized worldwide. Resistance is most common in Cooperia, but increasingly reported in Haemonchus, Ostertagia and Oesophagostomum. Resistance to chemical dewormers is caused by a slow buildup of “resistance genes” in parasites from repeated drug treatment over many years. These genes accumulate undetected over time until the point when so many resistant worms survive there is an obvious treatment failure. Resistant worms are not more aggressive or deadly but they simply survive in high numbers after deworming, causing disease. So why, if livestock has been raised for hundreds of years and dewormers have only been around for the last 50 of those, are such dramatic effects seen if drugs fail? Unfortunately, this reliance on chemical deworming has allowed selection of bulls and replacement females with high production numbers but ignored their genetic inability to resist parasite issues. As Dr. Kaplan explained, we have developed “wimpy” animals when it comes to fighting parasites. Additionally, chemical deworming has allowed neglect of husbandry and pasture management factors that keep worm burdens naturally low. 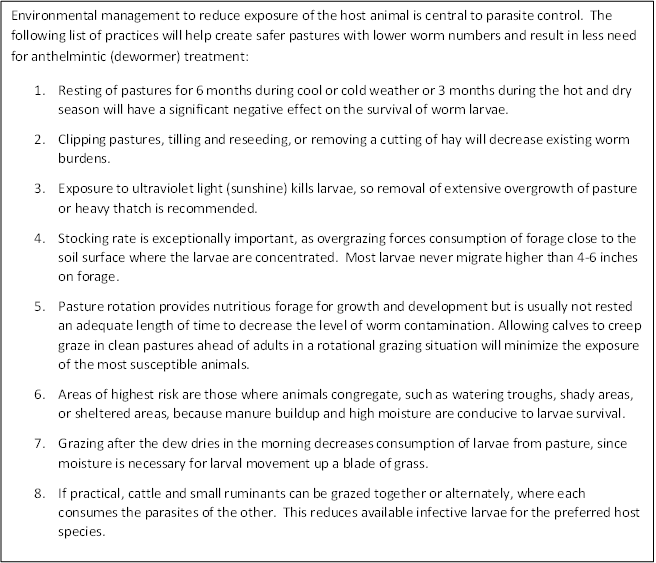 For example, overstocking a pasture means more feces, more worm eggs and larvae after egg hatching, shorter grass and more parasites in animals. This is a management problem and not the fault of the animal or the dewormer. Ensure the treatments we administer are very effective. Given the common state of dewormer resistance, use of drug combinations is essential. Combinations slow resistance because they kill more resistant worms! An example of this is using LongRange® injectable and using a drench dewormer (SafeGuard®/ Valbazen®/Synanthic®) at the same time. The purpose of the second drug is to kill any worms that survived the first drug, resulting in much fewer worms left to reproduce. Conversely, if drugs are underdosed or administered in a manner with reduced bioavailability or absorption, then partially resistant worms are more likely to survive and mate to produce fully resistant worms. Posted by Smith at 5:10am April 16, 2018 Posted in Health, Management, Pasture. Bookmark the permalink.